How to discover Sevilla in just two days and loved it? 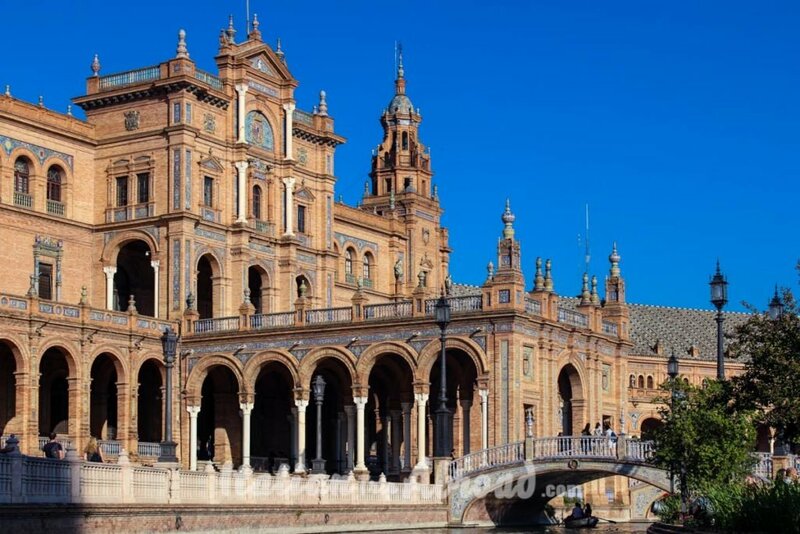 This Seville itinerary is the ideal for who love to walk and photograph building with an ancient history. The Andalusian Capital has got an enormous heritage in architecture, history, and awesome gardens. 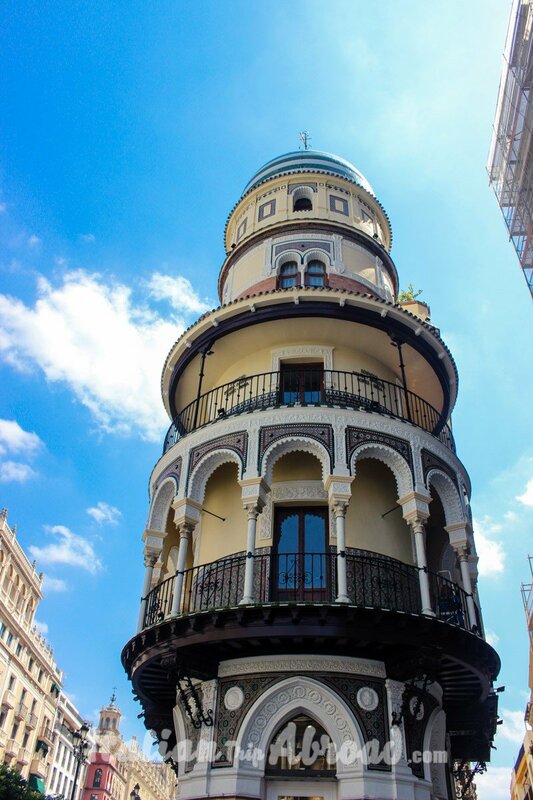 In our itinerary of Seville, we will take you discovering the best of the city. Citytrip Sevilla Tips is not just a guide. It is a mandatory plan on how to have the best of your two days in Seville or 3 days in Seville. 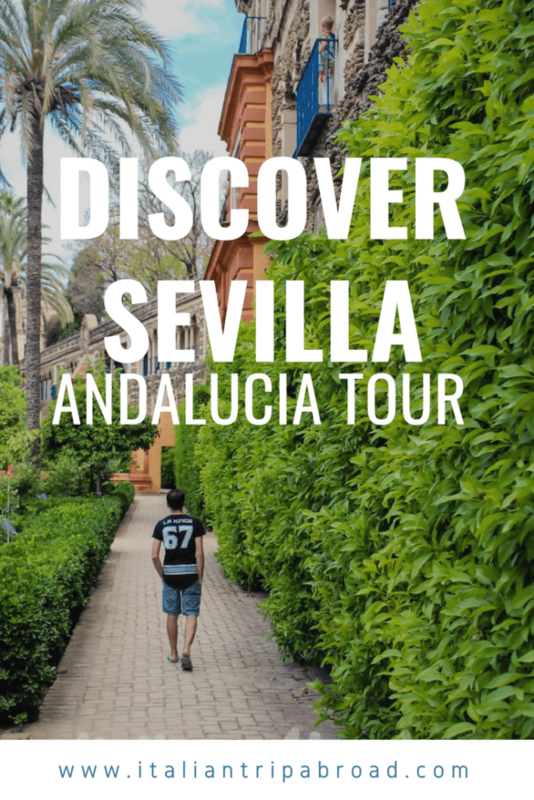 In your Andalucia Tour, you will discover a lot of Spanish cities which are awesome but Seville got something which it is almost impossible to describe. 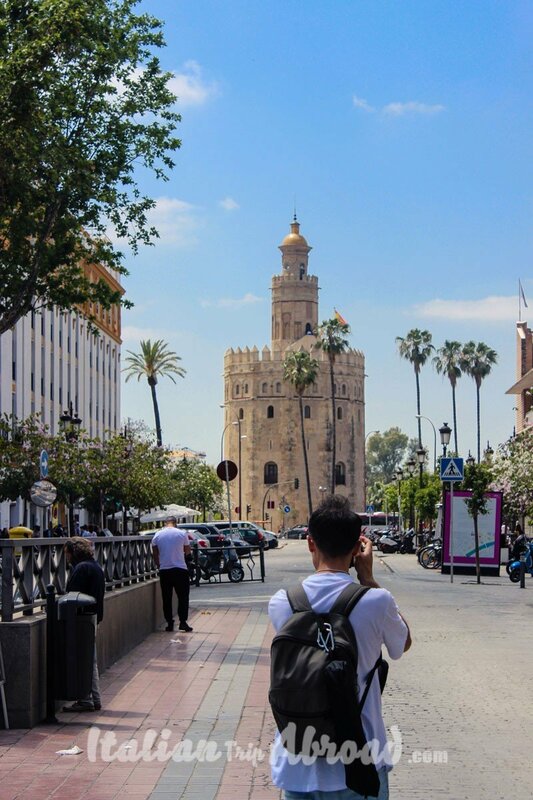 Pack your bags, fly and discover Sevilla. Are you ready for your Itinerary Seville? Start your day with a great Spanish breakfast and be ready to walk. 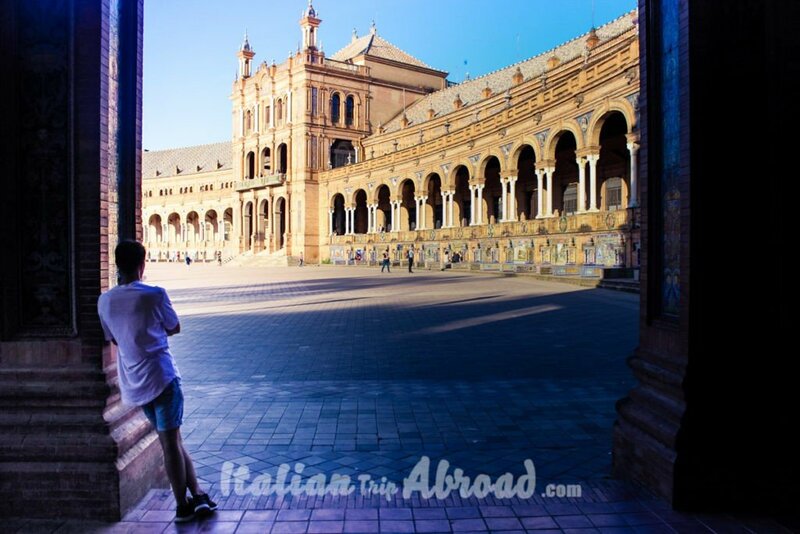 Right here you will find a short list of places to don’t miss to visit in Seville. 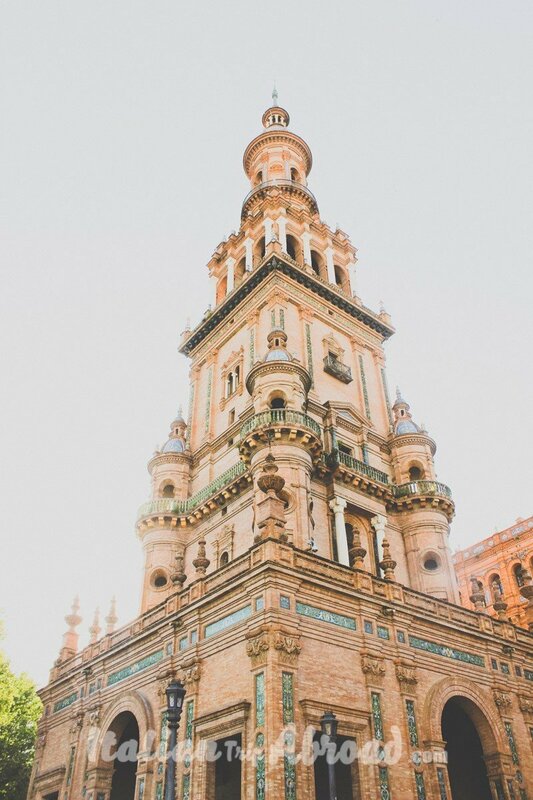 A simple structure where you will have highlighted places you must see in Seville. Here we go when we will push you to discover Sevilla. It is a very nice city, you can see everything just walking. It is perfect if you plan to spend a few days to discover Sevilla. One day in Sevilla will be not enough at all. Plan to spend at least 2 days in Sevilla or three-days in Seville. All the main attraction are located in the city center. Don’t worry if your accommodation is a bit far away from the centre. You can reach the centre of Sevilla very easily with the metro and the trains. The public transport of Sevilla is really good. There are a lot of things to see in Seville. Once you will reach the centre you will understand why we love so much this city. 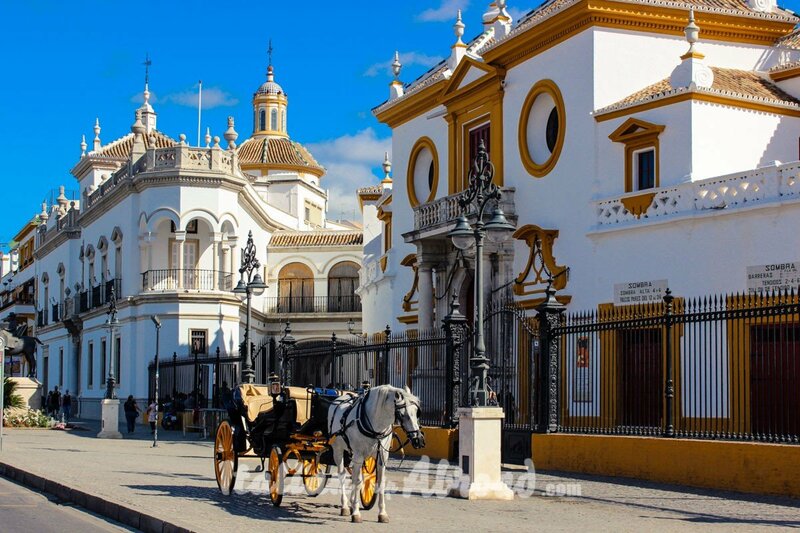 You will be surrounded by the beauty of Seville and understand why we call it “Magic city”. This it will be the best part of your Seville Itinerary. When we arrive in Plaza de Espana we were without words. Absolutely breathtaking. We discover Seville like this, just walking around and finding the best photo spots.This is one of the best places ever. This massive building is Seville’s most impressive after the cathedral, for its sheer scale and grandeur. Plaza de Toros is a must see in Sevilla. It is one of the instagram worthy spot in Seville. This is one of the square that inspired us most! The Plaza is situated inside Maria Luisa Park, next to Avenida Isabella La Catolica. A pedestrianised avenue with ice-cream sellers and bike rental stands. This is the best way to reach the park. Enter near the Teatro Lope de Vega and Fabrica de Tabaco. You also can reach the park from the Prado de San Sebastián on one side, or the river on the other. The reason why this building is different compared to the other is to research on how it was built. The location of some neighbouring houses prevented the construction of a perfect circle.Walk around the plaza and imagine the place full of people getting ready for a “Tarde de Toros”. This design of the Spanish square is inspired by the Roman amphitheatres, and you can see this inspiration even in modern plazas everywhere in Spain. Probably being the best example the plaza of Valencia. La Plaza de Toros de la Maestranza is the name of the bullring of Sevilla. The exact construction date is unknown, as it went through wars, crises and different architects took over the project. We were so surprised to see this amazing Plaza de Toros. When, days before, we have been in Malaga it was not really nice. The building and the structure is pretty the same, but in Sevilla, we suggest to visit the Arena. The building was partially destroyed in 1805 by a hurricane. An incredibly uncommon phenomenon in this part of the world. This is one of the most important plazas in Spain. It has appeared in many movies and of course, it is one of the main buildings in Sevilla. One characteristic that makes this plaza unique is its shape. It is not a perfect circle like most of the other plazas, the arena here is elliptical. The Royal Alcazar is one of the Unesco World Heritage sites of Sevilla. It is on the same style of the Alhambra Palace of Granada. It must be in your list of sightseeing Seville. Suggestion: Book your tickets online so you can jump the queue and you don’t have to wait a lot. The ticket is not expensive it’s only 9 euro and 50 cents. For those under 16 years old the access is free and for the student between 17 and 25, the ticket is just 2 euro. This is one of the best places where to take pictures. If you want to get inspired you can find our blog post about Instagrammable Seville. There we show where are the best places where to take photos in Sevilla. It’s not far away from Plaza de Toros, you can reach very easily even from the Cathedral as is close to the riverside. Walking around and while you want to discover Seville for sure you can’t miss this amazing monument. Torre del Oro is a defensive tower dating from the 13th century. From that tower a thick chain extended to the far bank of the river, cutting off access to enemy ships. The tower defended the river entrance to the Barcas Bridge and land access to the Arenal, home of industrial activity. The tower was linked to the Torre de la Plata through sections of wall known as “coracha”. This passage is stretched to Seville’s Alcazar. La Giralda is the bell tower of the Seville Cathedral but used to be a minaret. As it was built when Seville was part of Al-Andalusm. It was one of the symbol of the Muslim occupancy of Southern Spain during the Moorish reign. The Museo de Bellas Artes is one of the most important art museums in Spain. It is probably the second one after El Museo del Prado in Madrid. It is built around three patios which are decorated with flowers, trees and the distinctive Seville tile work. The museum’s impressive collection of Spanish art and sculpture extends from the medieval to the modern. The collection is focused on the work of Seville School artists. Creators such as Bartolome, Esteban Murillo and, Juan de Vales Leal.The entrance is really really cheap 1.50 € and free for EU citizens and students. The structure consists of six parasols in the form of giant mushrooms. Whose design is inspired by the vaults of the Cathedral of Seville. Metropol Parasol is organized in four levels. The underground (Level 0) houses the Antiquarium, where Roman and Moorish remains discovered on site are displayed in a museum. Level 1 which is the street level, is the Central Market. The roof on Level 1 is the surface of the open-air public plaza. Shaded by the wooden parasols above and designed for public events. Levels 2 and 3 so are the two stages of the panoramic terraces, offering one of the best views of the city centre and an amazing restaurant. The city of Seville is famous worldwide for its culture, monuments, traditions and artistic heritage. This is the birthplace of the Flamenco and where the most amazing Spanish Easter processions take place. 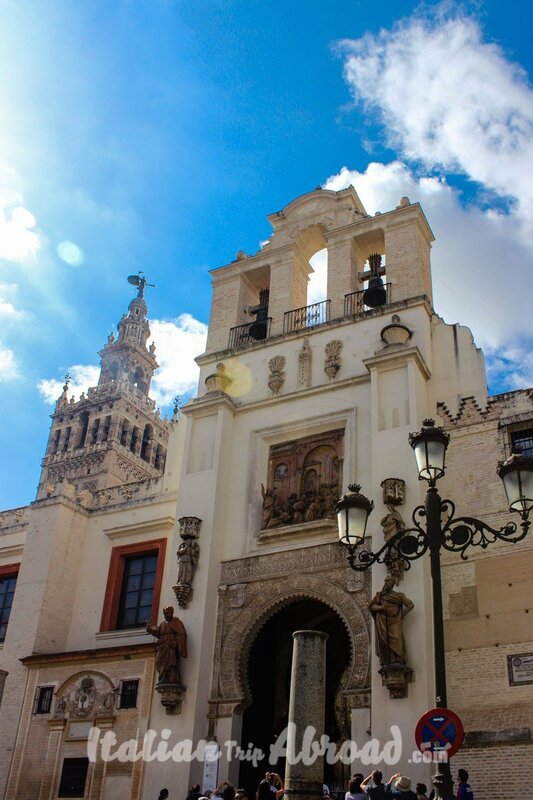 Plan to spend a Seville Spring Break and relax with the amazing spring weather and great food. Seville is the center of the Andalucia life, a city full of life and possibilities. Spring is amazing because of the high temperature that are between 20 and 30 degrees. Summer is so hot, Seville is famous to be the fried pan of Spain, with Summer temperatures over 40 degrees. Sevilla is also known for “La Feria de Sevilla”. The Seville Fair traditionally starts two clear weeks after Semana Santa. It take place in a huge area in Los Remedios, next to the river. This is a week of serious dancing, drinking, eating and socialising, with late nights or even all night long. If you are planning a spring break in Spain, you must know that one of the special period to visit Sevilla is Spring. Sevillan folklore is a very special event. La Feria de Abril is a period of the year where the locals are more happy. Locals prepares it for months before it starts. The origin of the Feria de Sevilla dates back to the 13th century, and as most of the Spanish ferias, it has a commercial background. La feria became more urban and social than trade-focused, eventually becoming the party that it is nowadays. How to plan your Sevilla Itinerary during the holy week? La Feria de Sevilla or Feria de Abril is a celebration that takes place every year during spring. If you want to visit the Feria as a traveler from outside of the region. You must be aware of certain aspects before rushing to pack your “Sevillana” dress. You have to take also those dancing shoes that you bought specifically for a good session of flamenco, hydrated afterwards with a cold “rebujito”. The Ferias is not a tourists attraction, it is mostly a traditional time of the year for the inhabitant of Andalusia. It is most suitable for the Sevillans, so if you plan to visit it, try to act like a local. This is because most of the “casetas” are private: A bunch of people will contribute with a certain amount of money throughout the year to set up their tent during the feria. They than will enjoy food, drink and music for free or reasonably cheap price. If you don’t have contacts in Sevilla that can get you in one of them, you certainly lost most of your chances, as you won’t be allowed into the private casetas. There are however some free casetas, so you still have your chance: These are the ones that belong to the political parties: PP, PSOE, IU, PCE, C’s, UGT, etc. Also, there are some free ones from certain districts, you might get in for free in the same way. However, these ones are ready for overpriced food, drinks and not the best samples of Sevillian society. On the other side, not everything is the tents. Just walking around the area from lunchtime until late night, and you will be impressed by the outfits that men wear. You will be overwhelmed by beautiful Sevillian girls wearing the traditional and world-known traditional dresses. Enjoy this during the typical sunny days of the region. Andalusia is well known for over 300 days of sun. Enjoy the Andalusian “Pura Sangre” horses pulling richly designed coaches. And, being Sevilla, the atmosphere will certainly be friendly. Be aware in the same way that finding accommodation during these days might be challenging and expensive. Also, the feria is the centre of the city during the celebration, so expect the rest of the city to be slightly “dead”. If you are around Sevilla during the feria, it’s worth passing by and enjoying the atmosphere.However, if you want to come specifically for this event without local contacts, there are many chances that you’ll be disappointed. The best places to enjoy social life in Sevilla are the “Terrazas”. There are thousands of them in the city and they are open the whole year, so don’t think at any point that the feria is unmissable. If you really want to enjoy the concept of feria, consider the possibility of going to the ferias of Córdoba or Málaga too.They are much more open to outsiders and although not so famous, they are as good as this one. Out of the Feria, we suggest visiting Granada and the amazing markets they do during the year. The first and very important thing is Sevilla is really hot during summertime. But it is also true that it really cold during winter. So, if you are planning your trip in Seville choose to travel between April ( which is really nice during April Fair) and May. September or October are also good month to travel to Sevilla. In 2018, the temperature on those two months reached over 35°.Plan your journey in advance so you won’t miss anything. Book your Alcázar tickets online and enjoy every moment, this is one of the best of Seville tours. 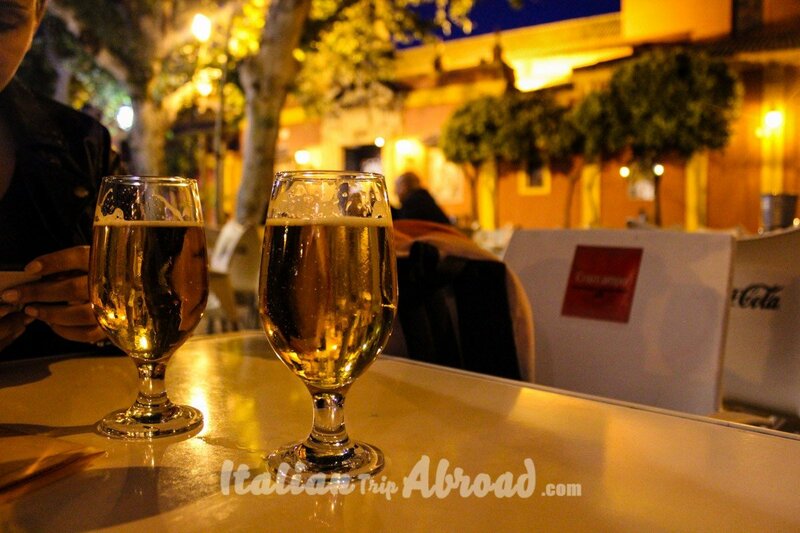 Discover Sevilla without visit a Tapas Bar is absolutely unacceptable. Go and check for the best Sevilla Tapas Bar. Do you want to know the best places to visit in Spain? Seville for sure is our favourite one, there is something magic which is impossible to describe. You need to discover the city by yourself to feel involved like us. Ibiza one of the most natural landscapes in Spain, not just a party place. If you skip the night vidaloca places, you will see the real essence of the Island. 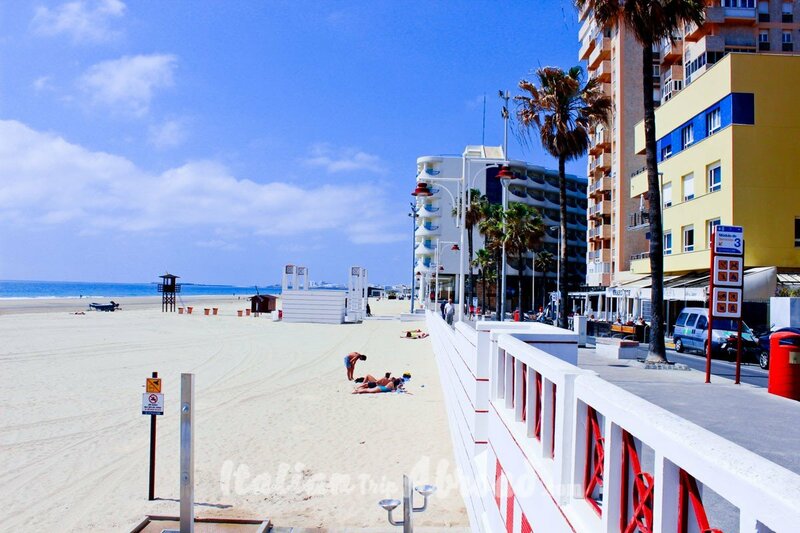 It could be really cheap and nice, out of the touristic places. Go for an amazing adventure Kitesurfing in Tarifa. It will be one of the best experience for you. Thinking about places for a spring break in Spain, Barcelona need to be on top of your list. A visit to the Capital of Spain, will be also a good idea. Spend three days in Madrid will be relaxing and enjoyable. We did a great plan on how spend 2 weeks in Spain, on the road obiviusly. 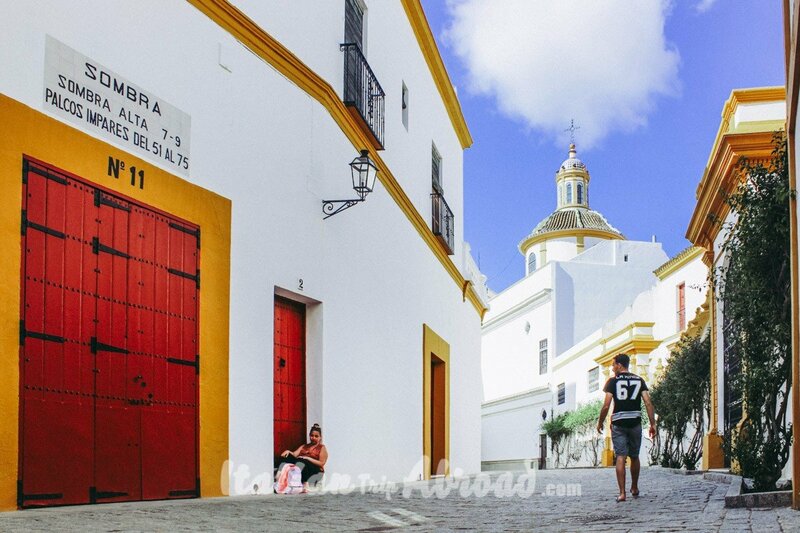 If you are planning a day trips from Seville you should consider Cadiz, because is a city look like a little town. So, You will feel involved in the real local life since you put your feet in the city. The seaside is awesome and in summer it is really crowded, with just one way going in and out of the city, it seems to be a little island. Barcelona is the first city Toti visited in Spain. It is one of the places he loves and we need to return. We feel to be at home there, it is looking like our home city, Napoli, and some of the streets are perfectly the same. 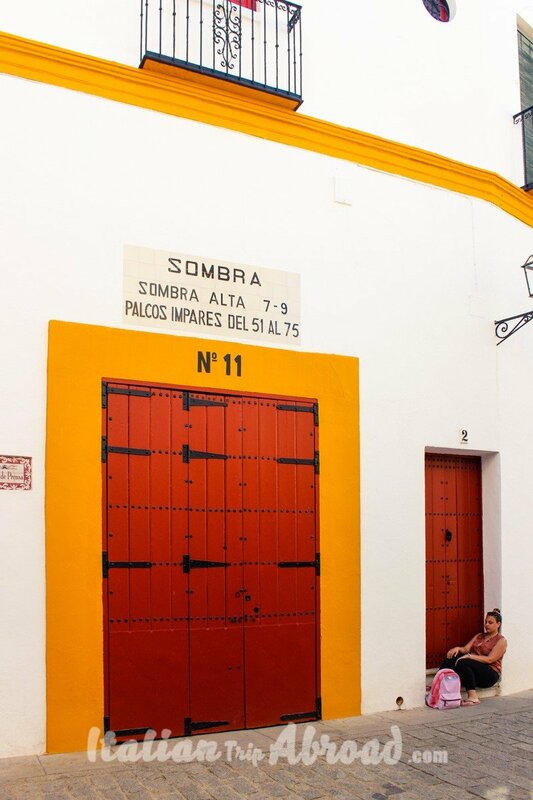 Help us to share our tips about Seville, share it on your Pinterest! 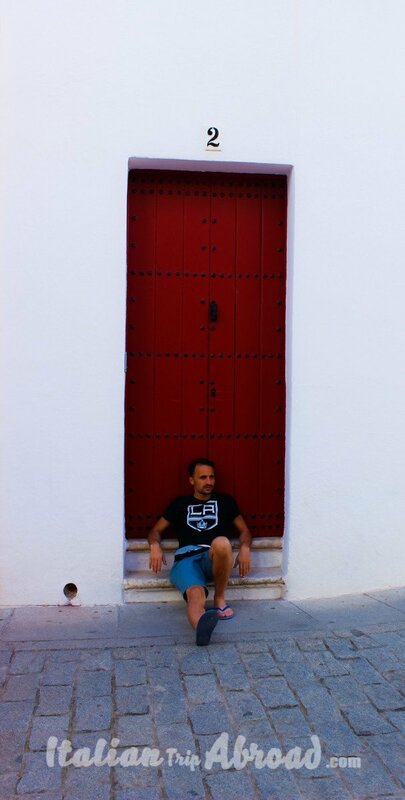 About this post, we will say a big thank you to Andres, our Spanish friend, currently living in London, for the huge amount of information about Sevilla and the right directions to how to discover Sevilla at the best. Also, we will say a big thank you to an Italian Instagram Friend, Irene Palmieri for the amazing videos about Sevilla. Seville is one of the top tourist destinations of 2018. I was there last year during the summers and I fell in love with the place. I revisited my memories through your blog post. You have gathered some great information about this jewel place and your photos are incredibly epic. We are really happy about it. Thank you very much for your comment! Wow. So much to see and do in Sevilla. A lot to do but it’s beautiful! This is a nice post about a beautiful city, you showed us what is the best part of the city to see, and when it’s the best time to come and visit the city, thank you for that. We really appreciate your comment and we are happy that you like our post about Seville. If you plan your trip there we will be more than happy to help you. Seville is a city in Spain that I’m really interested in visiting. It seems less busy and touristy than Madrid or Barcelona. I’ll make sure not to schedule a trip during the Feria, as I have no contacts in the city and don’t want to be disappointed in my time! The pictures are stunning. Would love to go there someday. So many thing to do at Seville, I bet people flock there during holidays. I have been to Sevilla and loved it. Your post inspired me to bring my kids there! Go! Book a ticket and flight to Sevilla, the weather is still really nice and hot. Enjoy! You have captured a lot of what makes Sevilla such a beautiful place to visit. I would love to participate in the Ferias, but as you said, perhaps one of the ones more accessible to outsiders than Sevilla. That’s a very nice, walkable place. We are always fascinated with Mediterranean cities and towns. Each has this certain unique charm to it. Truly, Spain is beautiful. I would love to visit Seville and Barcelona just for the architecture. Definitely, Andalucia is an amazing place for travelling! I have never Visit that place, but your post and pictures make me crazy and now I’m planning to visit that place. Thanks a lot to share this post. 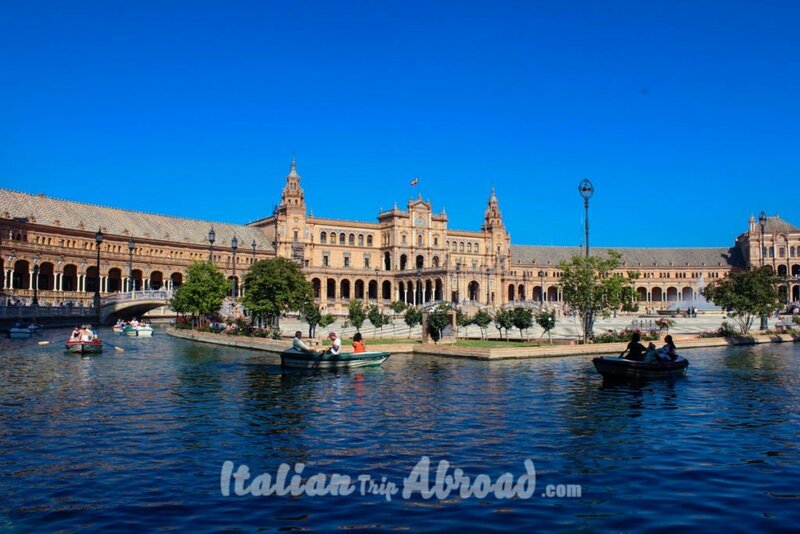 Very beautiful photos and useful information about the amazing city of Seville. We are looking forward to get enchanted by its beauty… This would be very helpful for us. I have just one question, where did you exactly take the particular Photo where the street with white & yellow houses are there and the gate is visible with title ‘Sombra’ and a lady is sitting below. I mean which street, quarter it’s from? I am particularly looking for photo opportunity for such architecture so it would be helpful for me. Is it from Santa Cruz or somewhere else?